One of the best ways to do so is to make a minimalist bathroom. Here, we list a few of the ways we can make your bathroom modern and minimalist. Simple and Straightforward – First, keep things simple. Modern design is about keeping an open and organic space without clutter. Do this by choosing built-in cabinetry and shelving to hide personal items. Store toiletries and other items so your bathroom is clean and uncluttered. Use backsplash and tile designs that focus on subtle and geometric shapes. This doesn’t just apply to bathrooms; minimalist home additions can also take advantage of this design philosophy. Modern Furniture – This aesthetic utilizes geometric shapes and straight lines and natural colors. Look for patterns, colors and materials that fit these principles when choosing your fixtures and bathroom essentials. With a uniform design, you can create a focal point for guests when entering the bathroom. Lighting – Lighting is one of the biggest and most recognizable facets of modern, minimalist bathrooms. The right type, intensity and arrangement can make or break your bathroom’s ambiance. To make the most of your lighting, choose fixtures that emphasize geometry and contours. Natural lighting is also a good idea, such as skylights. Wall-mounted lamps, recessed lighting and accent lights round off the look. Bathtub Design – Balance is key when choosing a freestanding bathtub. The bathtub is not only a functional piece; it’s also a design component, so take it as such. Put it in a place that can improve the visual appeal of the bathroom. How the bathtub looks is also a consideration; angular bathtubs work in a minimalist bathroom because of their straight, simple edges. These are just a few of the things to consider in minimalist bathroom design. 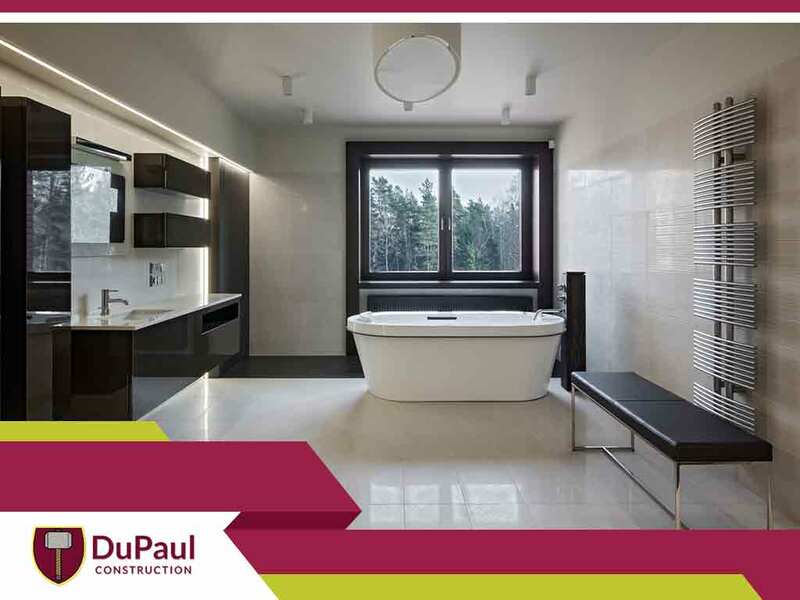 DuPaul Construction also offers other home improvement services, including basement renovations. To learn more, call us today at (304) 759-8543. We serve Charles Town, WV, and nearby areas.